Do Resistance Bands Increase Vertical Jump? Resistance bands can help you increase your vertical and out-jump the competition. So you want to increase your vertical. If that’s the case, then resistance bands can be just what you need to leap to success. As a highly versatile -- and cheap -- piece of training equipment, resistance bands help you increase your vertical jump while also helping you improve your overall strength, power and general fitness. 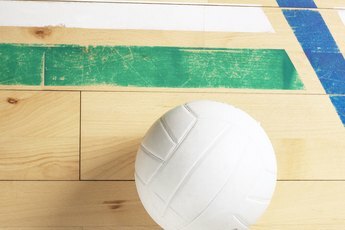 Whether you play basketball or volleyball or spend your time in front of the high-jump bar, you can improve your game by using resistance bands. When developing your vertical jump, you need to focus on two main factors: strength and power. These help you explode off the ground with greater force and get higher in the air. When it comes to strength, resistance bands can help you develop the muscles in your legs, enabling you to log more hang time. Try exercises such as resistance band squats, lunges and calf raises focusing on good form and deliberate movements. Your upper body plays a key role in helping you sky above the competition. With strength from your upper body and core, you generate momentum that helps propel you upward. Resistance bands can help you develop strength in your chest, shoulders, biceps and triceps as well as your lower back and abs. Get to work improving your vertical by using bands for upper-body moves such as pec flies, bicep curls, triceps extensions and shoulder raises. Then get even more powerful by using them for core moves such as resisted torso twists and side v-crunches. One of the best ways to improve your vertical jump is to -- you guessed it -- jump. 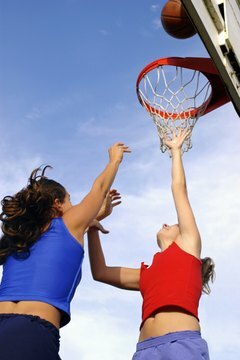 And by adding resistance to your movement, you can increase your ability to jump higher when the resistance is removed. Using a pair of bands attached to a 50-pound dumbbell, strap the bands over your shoulders and leap against the force of the bands, aiming for three sets of 10 reps with moderately challenging bands. Then strap a band around your knees and perform standing box jumps, again, shooting for three sets of 10. Whenever you’re working with resistance bands, make sure you’re familiar with each exercise before you try it out. Doing any move improperly can lead to serious injury, which only sets you back in your quest to jump higher. If you start getting fatigued too quickly during workouts, either increase your rest time between sets or decrease your band level. Also, as always, check with your physician before starting a new exercise or training program. ResistanceBandTraining.com: Training With Bands to Increase Your Vertical Jump. Do Resistance Kinetic Bands Help You Run Faster? What Are the Benefits of Ballistic Exercises? Do Resistance Bands With Gloves Help Punching Power?